Call Florida Bee Removal, Inc. for all of your bee issues! We specialize in live removal and relocation of bees. In addition to bee removal in Tampa (including Africanized bees) we remove wasps, hornets, yellow jackets as well as bee hive and honey removal. We are licensed and insured and perform bee removal service not only in Tampa, but the entire state of Florida and the Tamba Bay area. Under normal circumstances, we typically have a same-day response in Tampa, FL. Call Florida Bee Removal, Inc. whether you need bee removal services, or perhaps you have a bee swarm or yellow jacket nest on your property in Tampa or Hillsborough County and would just like additional information. We have been in the bee removal business over 50 years and enjoy every bee removal adventure. You are never a bother to us, we love the phone to buzz for bee removal in Tampa, FL! If you are located in Florida, you come into contact with bees. It’s just a fact of life. Sadly, you don’t know if you’re dealing with aggressive bees or non-aggressive bees until it’s too late. At Florida Bee Removal, our experts are highly qualified and properly trained in safe, effective bee removal techniques. We offer same-day service at a fair price. When we can safely and effectively perform it, Florida Bee Removal prefers to practice live bee removal of the bee hive if at all possible. When we have safely removed the live bees from your property we turn them over to a local beekeeper in the Tampa area so they may be safely managed. When we have safely removed the live bees from your property in Tampa, we turn them over to a local beekeeper so they may be safely managed. Our goal is not to exterminate bees, rather remove the danger of the bees from your property and keep them in their natural habitat so they can continue benefit our evironment. 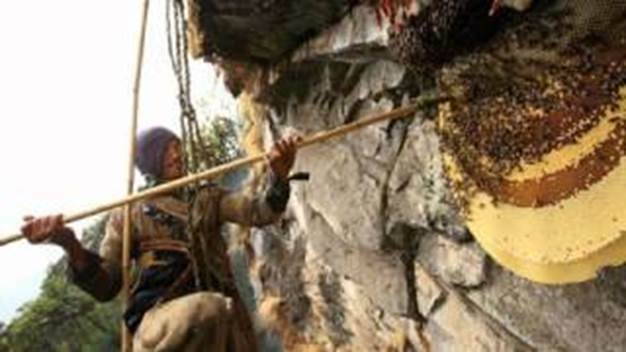 Other stinging and aggressive insects such as wasps and yellow jackets must be exterminated and removed from the site. 2016 marks the beginning of our 55th year in the adventurous pursuit of bee removal and relocation in Tampa, FL. I still remember well those indian summer days of fall in North Carolina. Asters and goldenrods lingered still along rural roadsides and abundantly in meadows and on hillsides. This rich floral display was the bees’ final banquet prior to winter. Drifting red and yellow leaves would soon litter the forest floor turning brown and crunching beneath our feet. 2017 bee removal in Tampa, FL was below average for bee colony survival. This was reflected in less bee removal for Florida Bee Removal, Inc even though our Google listings were promoted near the top of page 1 for most Florida cities. In Florida, yellow jacket colonies often reach enormous size. Such was the case of this monstrosity, occupying most of the floor bed of a full-sized pick up truck. 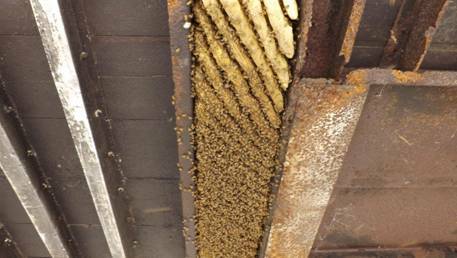 It was an overcast Fall day in Tampa when the Apian Team was scheduled to eradicate and remove this colony of thousands of yellow jackets and their nest. When my assistant and I approached, busy foragers zipped past our veiled heads. Realizing that one sting would burn for nearly 10 hours, we were not about to risk injury without being fully protected. The entire paper envelope was first treated and then removed. This exposed multiple stacks of inverted brood combs. These were also removed and placed into a contractor garbage bag. The remaining Tampa yellow jackets were treated with pyrethrum dust. Park workers in Tampa were attacked and inured by a swarm of africanized bees. HONEYBEE, WASP, AND OTHER STINGING INSECTS REMOVAL, CONTROL, AND RELOCATION FOR ALL OF HILLSBOROUGH COUNTY AND NEARBY COMMUNITIES. In addition to bee removal, we are licensed through the State of Florida to remove and eradicate rats, mice and other pests in south and central Florida. Visit our website for contact information.